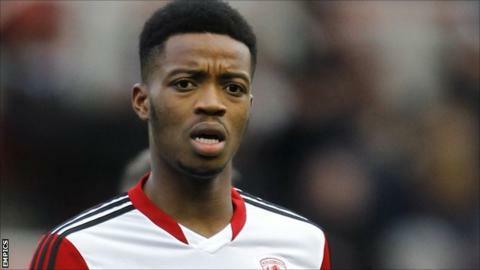 Chelsea midfielder Nathaniel Chalobah says the atmosphere at loan club Middlesbrough has helped him settle at the Riverside Stadium. Chalobah, 19, made just seven starts for Nottingham Forest earlier in the campaign during a four-month loan stay. However, the England Under-21 international has already surpassed that tally for Boro since January. "This is probably one of the best changing rooms I've been in," Chalobah told BBC Tees. Nathaniel Chalobah is yet to make a first-team appearance for Chelsea but has been on loan at Watford, Nottingham Forest and Middlesbrough. He has also established himself in the England Under-21 squad, with his last cap coming in the 1-0 win against Wales in March. "The boys are fantastic, the staff are fantastic, and for a player to come here after a difficult time at the previous club is wonderful. "I'm really happy to be here and really enjoying my football." Sierra Leone-born Chalobah was an important part of the Watford side that lost to Crystal Palace in the Championship play-off final last season, making 39 league and cup appearances for the Hornets. Meanwhile, Boro's recent upsurge in form, with just one defeat in seven league matches, has perhaps come too late for the Teessiders to launch a promotion bid - only six games remain of the regular season, with 11 points separating them from the play-off places. Saturday's 1-0 win against Derby County also marked a first goal in Boro colours for midfielder Chalobah, who says there is still much incentive to perform even if the top six is out of reach. "We're playing for pride, we're playing for the club, we're playing for ourselves and the people who turn up to watch us," Chalobah added. "It's easy to say we're playing for nothing but to the players, backroom staff and people who work at the club it's a bit more than that."